Nothing in the local tourism circle had been said yet about this quaint, hat-shaped (thus the name) islet at the middle of Burias Pass that belongs to the political jurisdiction of the town of San Pascual, Masbate. But San Pascual town Mayor Job Willard Rivera is hopeful and optimistic that the initiative over the weekend of the Regional Public Safety Battalion (RPSB) of the Philippine National Police (PNP) regional office based at Camp Gen. Simeon Ola in Legazpi City in introducing the place to tourists would reveal its exotic secrets. The RPSB First Maneuver Company, led by its company commander Senior Inspector Ebuenga Dipad Jr,. with over a dozen tourists from Manila and several local journalists in tow, explored the islet comprised of a land area of about 10 hectares enclosed by a coastline of glittering white sand and crystal clear beach water. 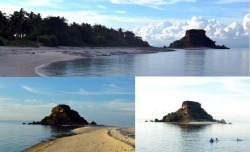 Sombrero Island, which belongs to a group of six islets at the western tip of Burias Island covering San Pascual and Claveria towns, is one of the three major islands of Masbate province. The nearby islets of Arena, Templo, Taguingui, Tinalisayan and Busing that bare fantastic rock formations are exciting places for island hopping and tropical getaways. Sombrero Island, with a latitude of 13.14 (13° 8' 32 N) and a longitude of 122.85 (122° 50' 43 E), is a hypsographic (island) situated 93 kilometers west of Legazpi City, Bicol’s regional government center and 259 kilometers south east of Manila.San Pascual is a 4th class municipality of over 8,000 households representing a population of nearly 40,000 residents that rely mainly on farming and fishing for their livelihood. The exploration expedition started with an over two hour boat trip from Pasacao, Camarines Sur. From San Pascual town, another one-hour boat ride took the group to Sombrero Island. The memory of exhaustive boat ride vanished as we endulged in the sumptuous meal of delicious seafood of lunch—grilled tuna, kilawing posit squid), calamares, stewed vegetables and fresh fruits. A fulfilling feeling after a heavy meal drew everyone to take a nap under a relaxing wind blowing mildly from the surrounding waters of Alimang Bay. At near dusk, the group frolicked around the fine white sand around the island while watching the beautiful view of the sun setting and being sent off by a skin soothing cool wind that at the same time welcomed the rising of the full moon whose bright glare illuminated the clear and meekly tamed sea water. At nighttime, the fishing lanterns used by fishermen off the tropical getaways' coast provided the sea with flickering lights. The tourist group joined by Dipad’s security group set a bonfire and music from group singing accompanied by guitars broke the silence of the night. “The biggest lure of the island is the fact that it is quaint. It remains one of the uncongested tropical getaways, affordable, very private and secluded,” Police Inspector Domingo Tapel, Assistant company commander of the RPSB’s First Manuever Company said. “You should visit Sombrero because its rich biodiversity of marine ecosystem offers a once in a lifetime experience to those who love to commune with nature. The secrets of Sombrero and its neighboring islets are exciting to discover,” he added. Tapel said that aside of public safety, eco-tourism makes Sombrero Island a stand out. He also assures travelers that a trip here will not burn a hole in the pocket.